Vi Local Rack Options - Akwil Ltd.
Vi Local Rack Options There are 19 products. 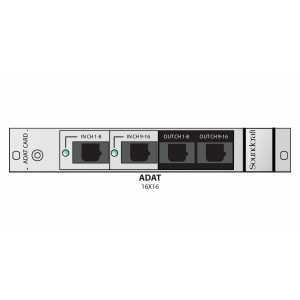 The Cat 5 version offers cost-efective connections to a Soundcraft Stagebox using Cat5 cable terminated in robust Ethercon connectors. Distances of up to 120m are possible using approved Cat?5 cables. Cat5 MADI breakout panel with two Amphenol connectors. Multi-mode MADI card. Provdes MADI functionality on two duplex industry standard SC connectors, allowing redundant cabling with automatic switchover. Connection distances of 1500m are possible. For longer distances, the single-mode card is required. Compatible with Vi Local Rack and Compact Stagebox. Single-mode MADI card. Provdes MADI functionality on two duplex industry standard SC connectors, allowing redundant cabling with automatic switchover. Connection distances of up to 10km are possible. Compatible with Vi Local Rack and Compact Stagebox. 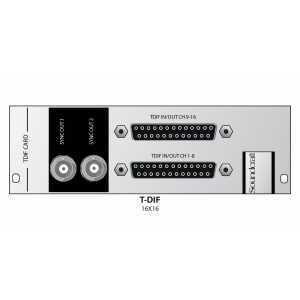 Optical MADI breakout panel with two expanded beam Fibrecast connectors. Four analogue mic/line inputs, electronically balanced, with 24-bit, 48kHz delta-sigma A/D converters. Green ?signal present? and yellow ?phantom power? indicators per channel Inputs on standard 25-pin D-type connector (female). Eight-channel, 24-bit line output card with 24-bit D/A converters with 48kHz operation. Electronically balanced outputs. 7-25dBu maximum output level. Outputs on standard 25-pin D-type connector (female). Compatible with Soundcraft Vi Local Rack and Compact Stagebox. Eight-channel line input card with 24-bit 48kHz A/D converters, delta-sigma conversion. Transformer balanced inputs. 7-26dBu maximum input level. ?Signal? present? LED indicator. Inputs on standard 25-pin D-type connector (female). Compatible with Soundcraft Vi Local Rack and Compact Stagebox. AES/EBU input/output card with 16 Ch I/O. With input SFCs only. Input SFCs can be bypassed individually. Output dither is selectable for every AES/EBU output from 24 bit, 20 bit, 18 bit or 16 bit. Settings are made with jumpers. Inputs and outputs on standard 25-pin D-type connectors (female). Compatible with Soundcraft Vi Local. The CobraNet card allows up to 32 channels of input or output signals (or a combination of both) to be received by or sent from console onto a CobraNet network. The card must be used as the Conductor for the network. By default, the card is configured for 32 outputs. 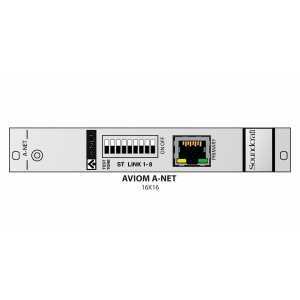 The Soundcraft A-NET 16V card provides direct digital connection on a single Cat5e cable from the Aux or Group outputs into an Aviom A-NET Pro16TM Series Personal Mixer (compatible with A-16II and A360). This card provides two 8-channel TDIF I/O interfaces with 48 kHz operation with word clock sync outputs on BNC connectors. Inputs and outputs are provided on standard 25-pin D-type connectors (female). Compatible with Vi Local Rack and Compact Stagebox.